We couldn’t have asked for a better six minutes of positioning on the biggest sports radio station on the planet, but it happened for the Suffolk Sports Hall of Fame on Tuesday, March 5, 2019. Greg Giannotti, a co-host on the Boomer & Gio morning show on WFAN, had recently traveled from Long Island MacArthur Airport and saw the Suffolk Sports Hall of Fame exhibit. He wondered when and how he could be on the same wall as his co-host Boomer, a legendary football player and broadcaster from East Islip. Tune to the 1:42 mark of the broadcast to listen. Gio listed a number of folks in the hall who he had connections with, including his high school football coach, Joe Cipp, and baseball coach, Neal Heaton, at Bellport High. 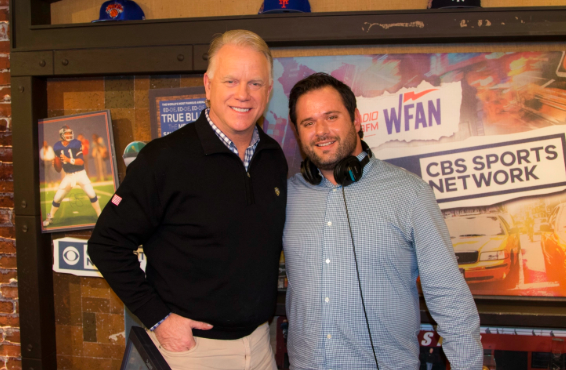 Fans, including a producer from WFAN, spent Tuesday afternoon petitioning the hall of fame for Gio’s induction. We replied as you’d expect, that there is a formal nomination and selection process that all 304 inductees have gone through since 1990. He’ll have to wait until 2020 at the earliest. We’re expecting gleaming recommendation letters from Boomer, Coach Cipp and Heaton. Gio wondered if there were any broadcasters in the Suffolk Hall of Fame yet. Yes, two currently and another being added in 2019. David Weiss from 1010 Wins, and former Islanders play-by-play announcer Barry Landers are already inductees, while legendary sportscaster and Commack native, Bob Costas, will be inducted this May.